Short descriptions and photographs of some photogenic microorganisms. 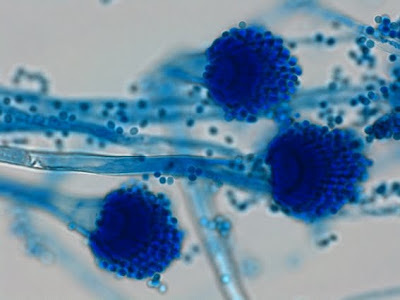 There are about 180 species of Aspergillus, 20 of which are recognized as being human pathogens. Aspergillus fumigatus is the species most commonly implicated, followed by Aspergillus flavus and Aspergillus niger. Most commonly, Aspergillus infections in humans are pulmonary (ie. involve the respiratory system) however they can disseminate to produce deep seated infections particularly in immunocompromised individuals such as transplant and neutropenic patients. 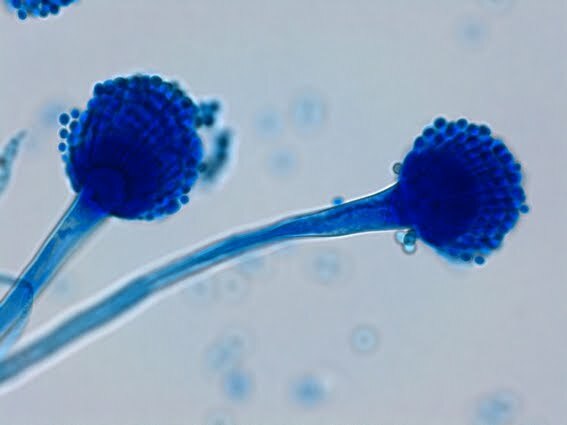 Aspergillus may also cause allergic aspergillosis and fungal sinusitis. Aspergillus is also capable of causing illness in other species such as birds and cattle. 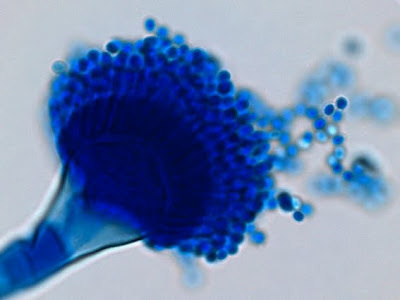 Aspergillus fumigatus is cosmopolitan & ubiquitous. Primarily a saprobic fungus of soils which can be found living on substrates such as plants, compost, seeds and wood chips, etc. 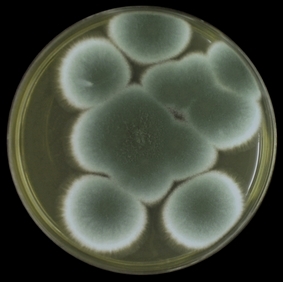 Hospital renovations have been implicated in the dissemination of Aspergillus fumigatus which can be detrimental to the patient and a nuisance contaminant for the laboratory. 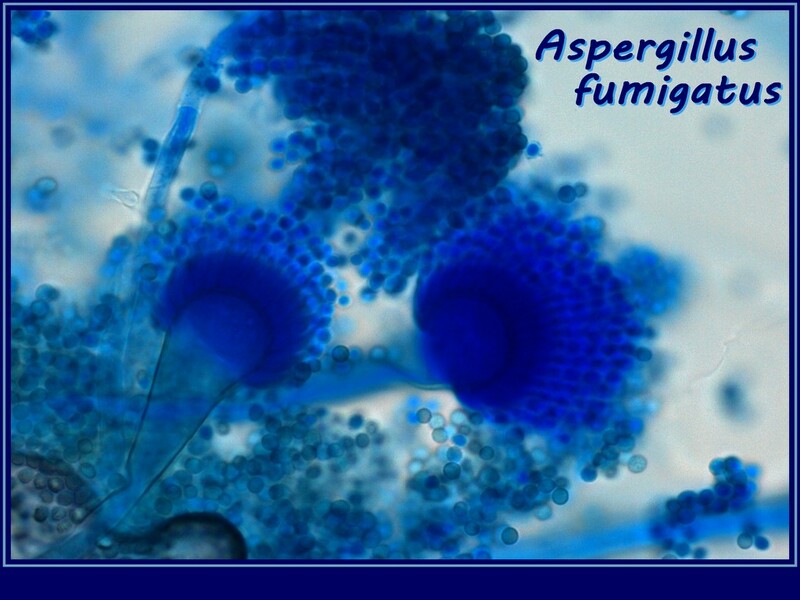 Careful consideration must be given before dismissing Aspergillus fumigatus as a laboratory culture contaminant. 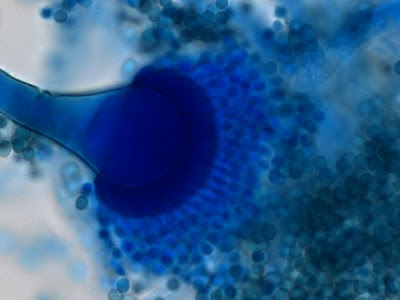 A.fumigatus is rapidly growing fungus which matures in about 3 days. Aspergillus fumigatus is thermophillic, with good growth to 45oC and often up to 50oC. This ability can be used to differentiate it from other species. The surface growth is velvety, downy or powdery, showing various shades of green, most commonly a blue-green to a grey-green with a narrow white border. The colour typically darkens with age. The reverse is white to tan to pale yellowish. 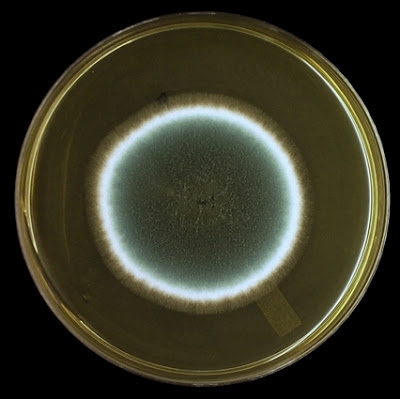 Colouration or shade can be dependent on the media on which the fungus is cultured upon. 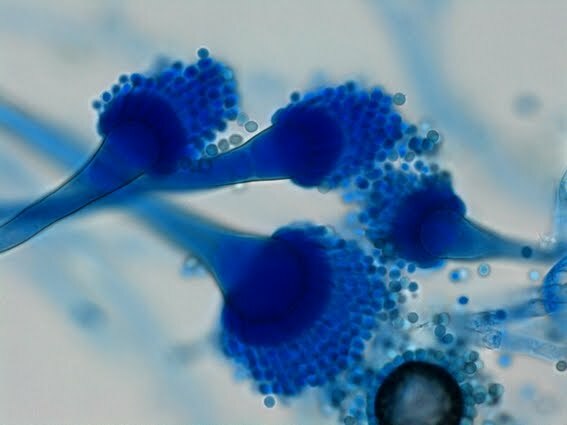 Hyphae are septate with smooth walled conidiophores (usually less than 300 µm in length and 5-10 µm wide). Vesicles are subclavate in shape, roughly 20-30 µm in width. Conidiogenous cells (phialides) are flask shaped, uniseriate, compact (closely spaced), usually forming on the upper two-thirds of the vesicle and mature parallel to the axis of the conidiophore (columnar formation). Young conidial heads may radiate. 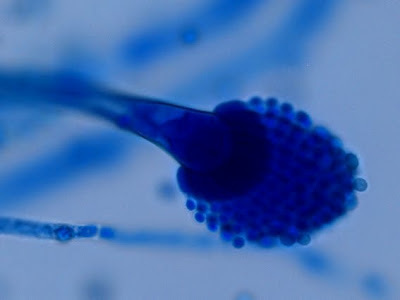 Conidia are verrucose (smooth or slightly rough), (sub)spherical and about 2-3.5 µm in diameter and develop in chains. Photos below were taken with the DMD-108 digital microscope. Magnifications are as noted. In my opinion, the uniseriate phialides (or biseriate in other species) are best visualized and determined under oil. The DMD-108 microscope has an addition optional digital magnification factor of X10 which can be utilized for even greater enlargement of features. Both adhesive tape and slide culture preparations were made and stained with Lactophenol Cotton Blue (LPCB). 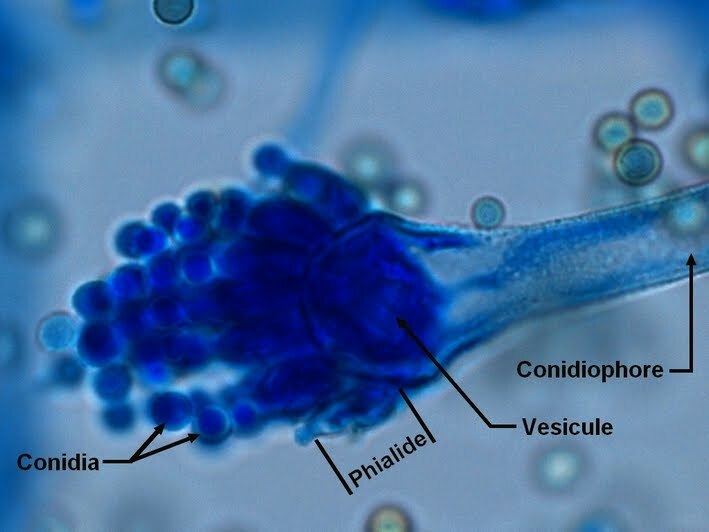 The formed chains of conidia were easily disrupted even with the slide culture technique. A little disappointing however the photos below were the result. 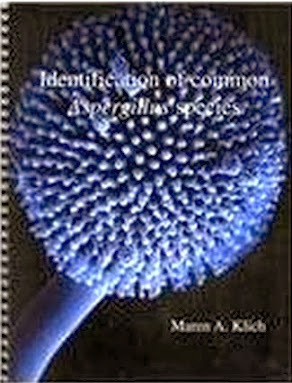 Aspergillus fumigatus produces a variety of mycotoxins, the major ones being Gliotoxin, verrucologen, fumitremorgin A & B. The information and photographs presented here were compiled for my own entertainment and should not be used as an absolute reference for medical and/or diagnostic purposes. Although I strive to ensure all information is accurate some errors or differences of interpretation may occur. Any errors mine alone. Fine text books, peer reviewed scientific papers and other internet references are available for detailed descriptions and analysis. My intent here was simply to share some of the pretty pictures I've taken over the years. There is artistry and beauty in all of these organisms! My apology for the lame title of this Blog. My wife suggested I try 'Blogging' to pass the time while recuperating from a major illness. This entire endeavor started somewhat as a joke, my never intending to do much more. 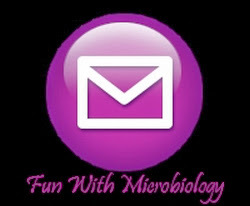 Put on the spot, I typed in "Fun With Microbiology - What's Buggin' You?" I now wish I could have thought of something clever and a bit more dignified. Somehow it all got away from me and I find myself enslaved to the site, trying to find more and more interesting "photogenic" organisms to document. Another apology appears elsewhere in this blog, however it is worth reiterating here. I apologize for the disproportional amount of fungal posts as this site should be about 'Microbiology'. As I had no original writing to contribute, I chose to share some photos which I had taken. While I would wish to have a somewhat equal balance of bacterial, mycobacterial & parasite posts, the majority of photogenic organisms that come my way are fungal. I hope this blog site has evolved into a collection of photo-essays on organisms covered in a bit more detail than found at other sites or in most textbooks. I was always disappointed in the single photo depicting an organism as found in most textbooks. Microorganisms are fascinating creatures which exhibit diversity and cannot be summed up in a few short paragraphs or depicted with a single black & white photo tucked into the bottom corner of a page. Microorganism are quite clever too - they have managed to evade our best efforts in being controlled for long or to be eradicated. As my prof once said "Microorganisms don't read textbooks so they don't know how they should behave." Hope you enjoy the photos shared here at "Fun With Microbiology - What's Buggin' You?" Blogger's text editor has at times refused to accept the symbol μm for micron (Greek lower case letter for mu) when pasted directly from my Microsoft Word Program. Blogger's text editor converts my μm into mm (1000X larger). I have tried to catch and correct this wherever it occurs but the reader must be aware of the scale of structures described and apply the dimension intended. As a community hospital, we stocked only the most basic of mycological media. The majority of plate photos are taken of cultures on Sabouraud Dextrose Agar which in our lab we refer to as SAB for short. Others my condense this to SDA. Please be aware that in this blog they refer to one and the same media. I apologize for any confusion. Some photos may be from Mycosel™ of Dermasil™ selective agars while others may be from the nutritionally minimal Corn Meal Agar (CMA). The agar used will be stated when appropriate. I would have liked to have used Potato Dextrose Agar (PDA) in some situations. All Micro photographs displayed on this blog were taken by myself except if noted otherwise. 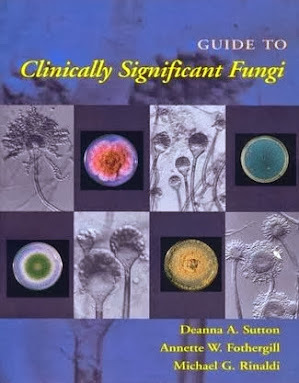 A list of fungal reference text books I found useful in preparing this blog can be found further below in this sidebar. 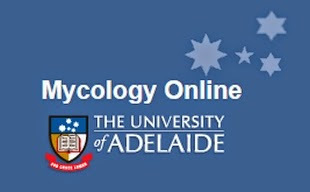 An excellent Mycology site created by the University of Adelaide in Australia. They have a fantastic Glossary of Mycological Terms which can be accessed by clicking here. 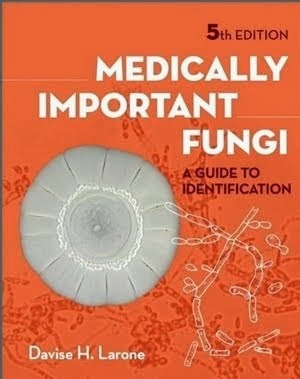 Below is a list of fungal reference books I found of help in preparing this blog. Many other fine texts books and reference materials are available and the reader should decide what suits their own needs. For ease of locating these books or further information about them, I have added links to Amazon. I have no personal connection with Amazon and these books can no doubt be obtained through other sellers or their publishers. Note: Some prices through secondary sources are outrageous. Try the original publisher first and science libraries may carry these publications also. 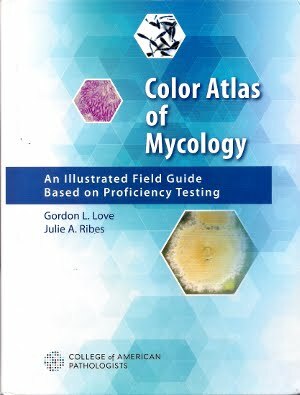 A wonderful new publication entitled 'Color Atlas of Mycology' by Dr. Gordon L. Love and Dr. Julie A. Ribes has been published through the Collage of American Pathologists (CAP). Dr. Love contacted me about a year ago requesting the use of some of the photographs which appear in my blog. I was delighted to be able to share a few of my photos with an even larger audience. The Atlas is available through Amazon (U.S.) or directly though the Collage of American Pathologists. 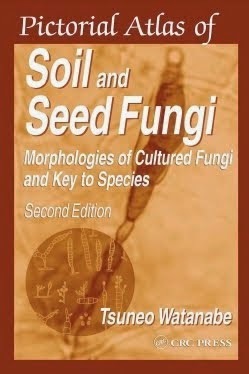 A wonderful addition to any mycology library. 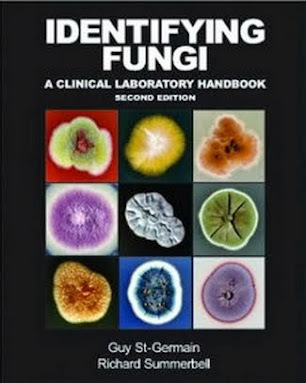 Atlas of Clinical Fungi, 2nd edition. 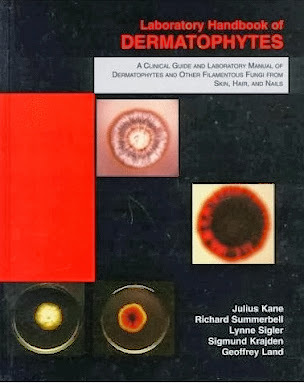 A Clinical Guide and Laboratory Manual of Dermatophytes and Other Filamentous Fungi from Skin, Hair, and Nails. While a more recent, 3rd Edition is available from CRC Press, the 506 page 2nd edition can still be downloaded free of charge as a PDF by clicking on the icon of the book above, or on the title immediately above. 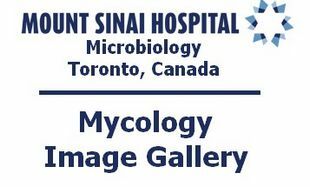 While most of the fungi discussed in this blog are of clinical importance, some can be found in this publication. 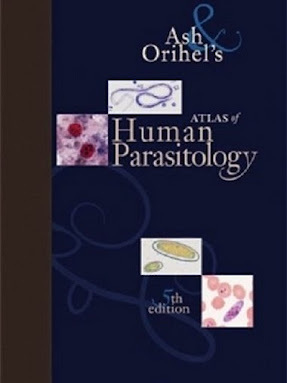 An excellent, but rather expensive, reference book on Human Parasitology. 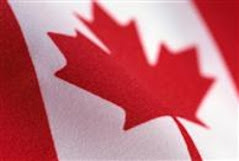 Extensive photo gallery with short, concise text. Click on photo icon to redirect to Amazon. Okay, here it is. You can contact me via the icon above. I've reluctantly added it but may regret it. Call it an experiment. I welcome any comments related to my posts, be it positive or constructive criticism. Please note that I probably will not respond to most comments as I barely have the time and energy to add new content to this blog. I absolutely will not offer to diagnose your ailment, be it that dry patch on your backside, that thingy you pulled out of your ear or that green stuff growing on the sides of your refrigerator! Please do not send me your photos for identification. I am not here to help you with your illness or your thesis! Finally, please realize, I am not a physician therefore I cannot offer medical advice. New: I have not subscribed to the Linkedin service and if my profile appears there I am unaware of its origin. Please do not ask to be added to my non-existent Linkedin profile. I freely share all my photographs on this blog site to all those who may find them interesting and useful. However, I do ask that you do not claim them as your own work, and give this site or myself credit when they are used publicly. Nikon photographs are at 300 dpi while the DMD-108 defaults to 72 dpi which was ideal for web publishing. This resolution may be inadequate for print publishing however there is a web site entitled 'All About Digital Photos' which claims otherwise. Please keep this in mind if you request the use of my photos. Please do let me know where and how you chose to use these photos as such feedback may assist me in deciding which posts to elaborate on or expand when I come across additional pertinent material. A final note - I do not offer many sources or citations for the information offered in this blog. Most of the information can be found in commonly available textbooks, some of which I've listed in the sidebar above. More specific information can be found in peer reviewed papers & journals. I have tried to relay the content as accurately as possible, however, as the title of this blog implies, I do this for "fun". Have your own fun by conducting your own literature searches. Immerse yourself in microorganisms - you won't regret it! !